Urban bike culture sometimes seems like an inside game, an exclusive club. One either belongs or is the opponent. Cyclists are on a mission, whether to be fit, to economize, to harmonize with nature, to take back the environment, to effect broad social change. Those who rely on automobiles just don’t get it. Another view of urban bike culture emphasizes inclusion, mutual support, adaptation, health and wellness, personal accomplishment, respect for the environment, urban planning, and societal growth. The book comprises four broad sections: For All The Right Reasons, Gearing Up, Community and Culture, and Getting Serious. The 50 chapters, each of which is an essay, encompass points from one end of this spectrum to another. The contributors to On Bicycles are cycling enthusiasts, some longstanding and others newer adopters of bike culture. They hail from diverse cities in Canada and the United States, and collectively can speak to experience or knowledge of the range of urban “cyclability” of many cities in these two countries, Europe, and Asia. The enthusiasm in many of the essays is profound and encouraging, even to a less capable or novice cyclist. For example, in “Shopping by Bike” in the Gearing Up section, the essayist recognizes the intimidation newer cyclists might experience when venturing to use a bicycle for regular shopping needs. She acknowledges the concerns associated with this purpose of cycling, then presents a patient, thorough and respectful overview of the options without a hint of condescension. Likewise, in the wonderful chapter “The Well-Tempered Cyclist,” the essayist is frank in her description of her former tendency toward the aggressive urban cyclist stereotype. She relates her transition to the titular character in a most amusing and even heartwarming way. 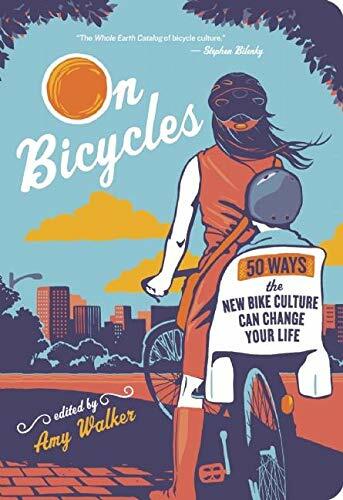 Other chapters, notably some in For All the Right Reasons, contain a few essays that could be a bit off-putting or intimidating for new cyclists or noncyclists. One or two come across as rather preachy, disdainful, or simply clubbish. Nevertheless, even these enlighten the reader about the essayists’ passion and enthusiasm for urban cycling. One quibble—a small though rather significant point—is that a few of the essays make broad or firm assertions without cited support. Many of these statements have the air of validity, but are specific and pointed enough that references to published research or statistics are notable in their absence. As a whole, On Bicycles is the kind of essay collection that any major urban public library should own. It offers motivation for new or interested urban cyclists, reinforcement for the experienced, and enlightenment for the uninitiated or skeptical. On Bicycles presents a clear window into urban bike culture. Residents—whether experienced, new, or noncyclists—of cycling-supportive cities such as Portland, Victoria, and Vancouver, San Francisco, and Minneapolis will see themselves reflected in the pieces. Similarly, urban cycling enthusiasts in cities where infrastructure may be yet inadequate or in transition will find plenty of useful and empowering information and support for their cause. Reviewer Kim Nayyer is a librarian in bicycle-friendly Victoria B.C. and the creative nonfiction editor of Island Writer.